Yes, girls all over the world are wanting to see photos of where the Jonas Brothers live. In the photos below, you can catch a glimpse of where the teen heart-throbs spend their family time. 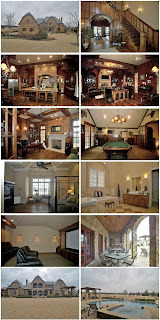 This beautiful 7,360 square feet 6 bedroom, 6.5 bathroom Westlake, TX home was asked to sell for $2,895,000. The beautiful home includes a game room, a huge kitchen that opens to a family room, a swimming pool and spa, and A LOT more! it is a perfect place to raise 4 kids who are always ready for an cozy rest stop. Click the link below for photos.